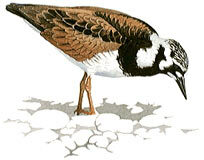 In the breeding season, the turnstone has bold black, white, and reddish-brown markings, which become duller in winter. Insects, particularly midges, and some plant material are its main food in summer, but in winter it forages on seashores, turning over stones and other debris with its bill to find mollusks, crustaceans, and even carrion. Breeding birds arrive from wintering areas in late May or early June. The 4 eggs are laid in a grass-lined hollow on the ground and incubated by both parents for 21 to 23 days.